Students with disabilities are spending much of their time in the regular classroom, both in Iowa and nationally. As the new school year begins, it is a good time to reflect on the students we serve. Teachers want to see all students find success in the classroom. But too often, it can be easy to fall into the thinking of “Students with disabilities aren’t my students. They would be better off in special education or Title 1 classes.” How accurate is that perception? In 2015, there were 480,772 Kindergarten–12th grade students in Iowa. Of those, 55,923 were students with disabilities, roughly 12% of school-age students. That means for every 10 students in a class, at least one student will have a disability. Clearly, students with disabilities are the students of all teachers. To assist teachers in welcoming every student to their classes, we will address five common questions about teaching students with disabilities. 1. Where are students with disabilities served? Judging by nationwide trends reported by the National Center for Education Studies, the proportion of students with disabilities served in the regular classroom is increasing, as is the amount of time students with disabilities spend in the regular classroom. Consistent with this national trend, the chart below shows that only 3% of Iowa’s students with disabilities are served entirely in special education classrooms. The other 97% spend some time in the regular classroom, with the vast majority spending over 40% of their time in general education. 2. Don’t we have different expectations for students with disabilities? Put simply: No. A report from the Center for Public Education confirms that the majority of students with disabilities do not have a cognitive impairment that would prevent them from performing at grade level. In fact, the vast majority of students with disabilities are required to be assessed on the same literacy standards and using the same reading tests as their grade-level peers. Some research has shown that as the expectations for students with disabilities have increased, the achievement of those students also has increased (Harr-Robins, Song, Garet, & Danielson, 2015). Not only are students with disabilities in all classrooms, but they need to be taught by teachers who maintain reasonably high expectations for them. 3. Isn’t teaching students with disabilities the job of the special education teacher? There are complementary roles for general and special education teachers in serving students with disabilities. Special education teachers should have particular expertise in planning and delivering differentiated or individualized reading instruction. 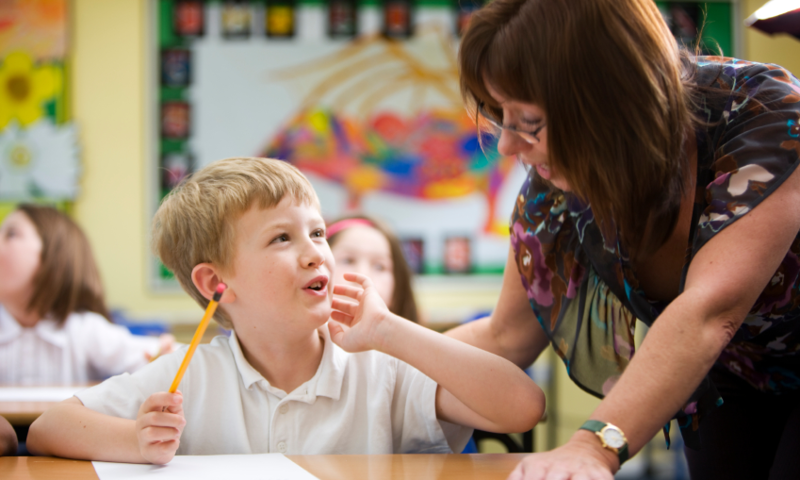 For students served primarily in a general education class, the role of the special education teacher is to help a student with a reading disability succeed in the class by collaborating with the primary teacher. These students are the responsibility of both teachers, who must work together to make the reading instruction successful. 4. What do I need to know to teach reading to students with disabilities? Students who are taught appropriately will learn to read, so consider the following. Students with reading disabilities may need additional supports and time to experience success. The individualized education program (IEP) for each student should identify the kinds of supports to provide. IEPs are not intended to be one-size-fits-all. As the name suggests, they should be unique to the individual student and determined by a team of experts, including at least one general education teacher. Work with the special educator to understand how to prepare for and implement the additional supports. There may be some simple adjustments to lessons or the learning environment that can be incorporated with minimal disruption to the regular class. Serving students with disabilities does not detract from the education of other students. Rather, effective instruction benefits everyone in the class. The What Works Clearinghouse is a resource for identifying programs with evidence of effectiveness. In addition, available practice guides synthesize what is known about foundational reading skills and make recommendations for assisting struggling readers. 5. So, what works in teaching reading for students with disabilities? Students with disabilities benefit from systematic and explicit instruction. Reading instruction should directly teach skills and strategies to develop students’: oral language, phonemic awareness, phonics, fluency, vocabulary, and reading comprehension. For those not making adequate progress in the general education classroom, increase the intensity of reading instruction. This can be done by reducing the group size, extending the instructional time, and increasing the frequency of lessons and practice opportunities (see our previous blog series on small group instruction). Effectively teaching a class of students at a range of ability levels can be challenging and requires careful planning. However, one of the most important things to remember is to utilize the available, proven techniques and programs for teaching reading to all students. Harr-Robins, J., Song, M., Garet, M., & Danielson, L. (2015). School practices and accountability for students with disabilities (NCEE 2015-4006). Washington, DC: National Center for Education Evaluation and Regional Assistance, Institute of Education Sciences, U.S. Department of Education. Shaywitz, S. E., & Shaywitz, B. A. (2016). Reading disability and the brain. In M.M. Scherer (Ed. ), On developing readers: Readings from educational leadership (pp. 146–156). Alexandria, VA: Association for Supervision and Curriculum Development (ASCD).